Thursday was a fine day with a gentle breeze to see us off from Las Perlas. This time we managed to time our start better, unfurling the new red Parasailor just before crossing the line, in with the first few boats out of the bay. It was the first time we had opened the new sail, but fortunately everything was joined together correctly and it is flying just as well as the broken one did. The light winds we are expecting for this leg mean that Anastasia will struggle to keep pace with the racing monohulls, but all being well we should arrive in Galapagos in the main body of the fleet. A lot will depend on how much fuel we want to burn as we pass through the Doldrums because we are not going to spend days waiting for wind like the old boats had to. The ARC penalty system adds between 1 and 2 hours to your time per hour of motoring, so that suggests if our sailing speed gets below about 4 knots then it makes sense to turn the engines on. Our most efficient cruising speed under engine is about 7 knots, burning about 7 litres per hour. We are carrying about 560 litres of fuel right now, giving us a maximum range of about 560 miles. We have 640 miles left to go so we can motor for much of the way, if necessary. 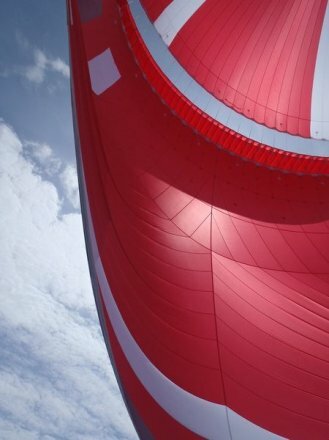 Andrea has provided this picture of the new sail so you can admire the colour.